The first Confederate bonds were issued in Montgomery, Alabama, the then-capital of the Confederate States of America (CSA). The CSA for formally proclaimed in February 1862 by the seven States that had seceded from the United States following the election of Lincoln. The capital was moved to Richmond Virginia in May 1861. Meanwhile four other states joined the Confederacy and two other States had both Confederate and Union government factions (Kentucky and Missouri). Maryland had pro-secession feelings but Lincoln arrested or barred the strongest pro-Southern State legislators from their constitutional duties to prevent enactment of a secession declaration. Maryland did provide many units that fought with the Confederacy against the Federals. In addition there was the Territory of Arizona encompassimg much of today's States of New Mexico and Arizona. 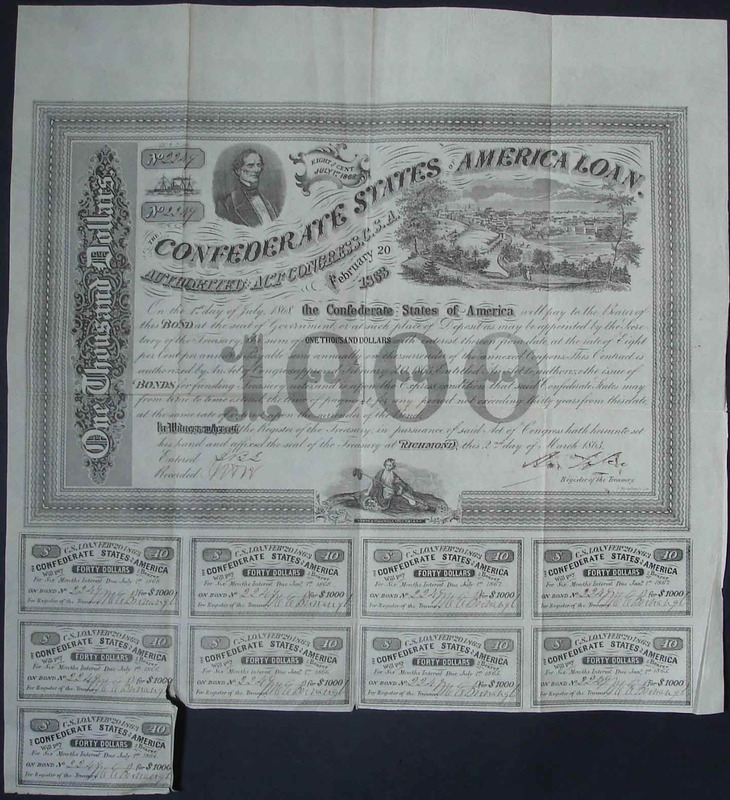 Confederate bonds were first cataloged by Grover Criswell who issued his Confederate and Southern States Bonds in 1961. Later Douglas Ball published his Comprehesive Catalog and History of Confederate Bonds in 1998. Each has its own numbering system, both of which are referenced to the particular bond pictured. Many sellers today have clipped the coupons of these bonds and sell them individually. What a shame to destroy part of the historical value of these bonds. Many of the bonds I picture were scanned years ago and I only scanned the bond itself and the first couple of rows of coupons because of the then-available technology. Each coupon bond pictured herein are complete with all uncashed bonds. These are collected by specialists who are few fortunately as even though these bonds were issued in very limited numbers, the prices are still very reasonable given their actual scarcity. This is one of the earliest CSA bonds issued in Montgomery. It is Criswell number 5A and Ball number 2. The $50 bond serial number 6277 was issued on 1 May 1861. It was signed by Robert Tyler, son of President John Tyler, and H. D. Capers. It was engraved by Douglas Engr. of New Orleans and pictures Commerce and Agriculture. A total of 7839 was issued. This is the thin paper variety. This is another of the earliest CSA bonds issued in Montgomery. It is Criswell number 6A and Ball number 4. The $100 bond serial numer 6219 was issued on 1 May 1861. It was signed by C. T. Jones and H. D. Capers. Coupons were signed by N. L. Ferguson. It was engraved by Douglas Engr. of New Orleans and pictures Commerce and Agriculture. A total of 7950 was issued. This is the thin paper variety. This is one of the last CSA bonds issued in Montgomery. It is Criswell number 7 and Ball number 6. The $500 serial number 3375 bond was issued on 1 May 1861. It was signed by Robert Tyler and H. D. Capers. The coupons are signed by C. C. Thayer. It has a signed date of Aug 29 at the lower right. There is no engraver's identification on it but it was done by the American Banknote Co in New Orleans. A total of 5250 was issued. This is another of the last CSA bonds issued in Montgomery. It is Criswell number 9 and Ball number 8. The $1000 bond serial number 4518 was issued on 1 May 1861. It was signed by C. T. Jones and H. D. Capers. The coupons are4 signed by E. C. Caldwell. It has a written date of July 25 at the lower right. There is no engraver's identification on it but it was done by the American Banknote Co in New Orleans. A total of 7071 was issued. This is one of the first CSA bonds issued in Richmond. It's authority was the Congressional Act of August 19, 1861 which authorized issuance of $100 million in debt. It is Criswell number 52 and Ball number 40. The $500 bond serial number 767 authorized by the Act of 19 August 1861 was issued on 29 December 1862. It was lithographed by B. Duncan of Columbia SC. It was signed by Robert Tyler There is no engraver's identification on it but it was done by B. Duncan in Columbia SC and it features the image of Thomas Bragg, the second Attorney General. A total of 831 was issued. This CSA bond was issued in Richmond. It is Criswell number 79 and Ball number 41. The $1000 bond serial number 819 authorized by the Act of 19 August 1861 was issued on 14 January 1863. It was lithographed by B. Duncan in Columbia SC. It was signed by Robert Tyler and it features the image of Samuel P. Moore, Surgeon General of the CSA Army, flanked by Law, Justice, and a woman with flag. The coupons were signed by E. S. Read. A total of 1093 was issued. This CSA bond was issued in Richmond. It is Criswell number 53 and Ball number 43. The $500 bond serial number 478 authorized by the Act of 19 August 1861 was issued on 21 January 1862. It was lithographed by Hoyer & Ludwig of Richmond, Virginia. It was signed by Robert Tyler and H. D. Capers. Coupons are signed by N. L. Ferguson. It features an image of a mother and children looking at a safe enscribed "Confederate States Treasury." A total of 866 was issued. This CSA bond was issued in Richmond. It is Criswell number 56 and Ball number 52. The $500 bond serial number 318 authorized by the Act of 19 August 1861 was issued on 25 March 1862. It was probably lithographed by Hoyer & Ludwig of Richmond, Virginia. It was signed by Robert Tyler. Coupons are signed by R. F. Nelson. It features the Virginia State Seal with Athena crushing a tyrant. A total of 957 was issued. This CSA bond was issued in Richmond. It is Criswell number 29 and Ball number 54. The $100 bond serial number 3618 authorized by the Act of 19 August 1861 was issued on 5 May 1862. It was lithographed by B. Duncan of Columbia SC. It was signed by Robert Tyler. Coupons are signed by N. G. Staples (?). It features the omage of R. M. T. Hunter, Secretary of State. A total of 8884 was issued. This CSA bond was issued in Richmond. It is Criswell number 30 and Ball number 57. The $100 bond serial number 709 authorized by the Act of 19 August 1861 was issued on 21 November 1862. It was lithographed by B. Duncan of Columbia SC. It was signed by Robert Tyler. Coupons are signed by S. L. Adasock (?). It features the image of Thomas Watts, Attorney General, flanked by Law, Justice, and a woman with flag. A total of 877 was issued. This CSA bond was issued in Richmond. It is Criswell number 85 and Ball number 62. The $1000 bond serial number 362 authorized by the Act of 19 August 1861 was issued on 12 November 1862. It was lithographed by B. Duncan of Columbia SC. It was signed by Robert Tyler. Coupons are signed by W. A. Feller (?). It features the image of President Jefferson Davis flanked by Law, Justice, and a woman with flag. A total of 1491 was issued. This CSA bond was issued in Richmond. It is Criswell number 31 and Ball number 63. The $100 bond serial number 589 authorized by the Act of 19 August 1861 was issued on 3 February 1863. It was lithographed by B. Duncan of Columbia SC. It was signed by Robert Tyler. Coupons are signed by M. F. Cary. It features the image of Judah P. Benjamin, Sectretary of the Treasury. A total of 906 was issued. This CSA bond was issued in Richmond. It is Criswell number 63 and Ball number 81. The $500 bond serial number 787 authorized by the Act of 19 August 1861 was issued on 10 October 1862. It was lithographed by B. Duncan of Columbia SC. It was signed by Robert Tyler. Coupons are signed by J. G. Hause (?). It features the image of S. R. Mallory, Secretary of the Navy. A total of 1397 was issued. This CSA bond was issued in Richmond. It is Criswell number 90 and Ball number 82. The $1000 bond serial number 418 authorized by the Act of 19 August 1861 was issued on 7 August 1862. It was lithographed by B. Duncan of Columbia SC. It was signed by Robert Tyler. Coupons are signed by R. F. Nelson (?). It features The Confederacy with flag and ships. A total of 1901 was issued. This CSA bond was issued in Richmond. It is Criswell number 19 and Ball number 83. The $50 bond serial number 941 authorized by the Act of 19 August 1861 was issued on 21 October 1862. It was lithographed by B. Duncan of Columbia SC. It was signed by Robert Tyler. Coupons are signed by W. A. Feller (?). It features Burton HBarrison, Pres. Davis' secretary. A total of 998 was issued. This CSA bond was issued in Richmond. It is Criswell number 37 and Ball number 84. The $100 bond serial number 295 authorized by the Act of 19 August 1861 was issued on 24 August 1862. It was lithographed by B. Duncan of Columbia SC. It was signed by C. T. Jones. Coupons are signed by R. F. Nelson (?). It features Robert Toombs, Secretary of State. A total of 1187 was issued. This CSA bond was issued in Richmond. It is Criswell number 20 and Ball number 87. The $50 bond serial number 2880 authorized by the Act of 19 August 1861 was issued on 10 March 1863. It was lithographed by B. Duncan of Columbia SC. It was signed by C. T. Jones. Coupons are signed by E. Liker (?). It features Thomas Bragg. A total of 3614 was issued. This CSA bond was issued in Richmond. It is Criswell number 38 and Ball number 88. The $100 bond serial number 596 authorized by the Act of 19 August 1861 was issued on 11 February 1863. It was lithographed by B. Duncan of Columbia SC. It was signed by Robert Tyler. Coupons are signed by E. S. Read. It features R. M. T. Hunter. A total of 934 was issued. This CSA bond was issued in Richmond. It is Criswell number 94 and Ball number 101. The $1000 bond serial number 1976 authorized by the Act of 19 August 1861 was issued on 15 December 1862. It was lithographed by B. Duncan of Columbia SC. It was signed by Robert Tyler. Coupons are signed by E. S. Read. It features Gen. Winder. A total of 2302 was issued. This CSA bond was issued in Richmond. It is Criswell number 68 and Ball number 103. The $500 bond serial number 518 authorized by the Act of 19 August 1861 was issued on 20 February 1863. It was lithographed by B. Duncan of Columbia SC. It was signed by Robert Tyler. Coupons are signed by M. C. Morton (?). It features George W. Randolph, Secretary of War. A total of 350 was issued, an additional 1381 was issued signed by C. T. Jones.. This CSA bond was issued in Richmond. It is Criswell number 69 and Ball number 108. The $500 bond serial number 1895 authorized by the Act of 19 August 1861 was issued on 6 January 1863. It was lithographed by B. Duncan of Columbia SC. It was signed by Robert Tyler. Coupons are signed by M. C. Morton. It features Robert Toombs. A total of 1844 was issued. \This CSA bond was issued in Richmond. It is Criswell number 73 and Ball number 120. The $500 bond serial number 259 authorized by the Act of 19 August 1861 was issued on 4 December 1862. It was lithographed by B. Duncan of Columbia SC. It was signed by Robert Tyler. Coupons are signed by N. Giles. It features T. H. Watts. A total of 2576 was issued. This CSA bond was issued in Richmond. It is Criswell number 101 and Ball number 129. The $500 bond serial number 746 authorized by the Act of 19 August 1861 was issued on 1 November 1862. It was lithographed by B. Duncan of Richmond Va. It was signed by Robert Tyler. Coupons are signed by N. Jefferson (?). It features J. H. Reagan, Postmaster General. A total of 3146 was issued. This CSA bond was issued in Richmond. It is Criswell number 21 and Ball number 132. The $50 bond serial number 543 authorized by the Act of 19 August 1861 was issued on 21 October 1862. It was lithographed by B. Duncan of Richmond Va. It was signed by Robert Tyler. Coupons are signed by W. N. Teller. It features an unknown man. A total of 2621 was issued. This CSA bond was issued in Richmond. It is Criswell number 48 and Ball number 133. The $100 bond serial number 747 authorized by the Act of 19 August 1861 was issued on 15 August 1862. It was lithographed by B. Duncan of Richmond Va. It was signed by C. T. Jones. Coupons are signed by H. G. Staples (?). It features E. C. Elmore, Treasurer.. A total of 2000 was issued. This CSA bond was issued in Richmond. It is Criswell number 102 and Ball number 135. The $1000 bond serial number 2709 authorized by the Act of 19 August 1861 was issued on 26 September 1862. It was lithographed by B. Duncan of Richmond Va. It was signed by Robert Tyler. Coupons are signed by C. R. Morton. It features C. G. Memminger, Secretary of the Treasury. A total of 3457 was issued. This CSA stock certficate was issued in Richmond. It is Criswell number 103 and Ball number 139. The $6200 certificate serial number 555 authorized by the Act of 19 August 1861 was issued on 27 February 1863. It was purchased by Emanuel Rebman. . It was lithographed by J. T. Patterson of Columbia SC. It was signed by Robert Tyler. It features a sailing vessel. A total of 5029 was issued. The reverse has a red stamp for transfer information. 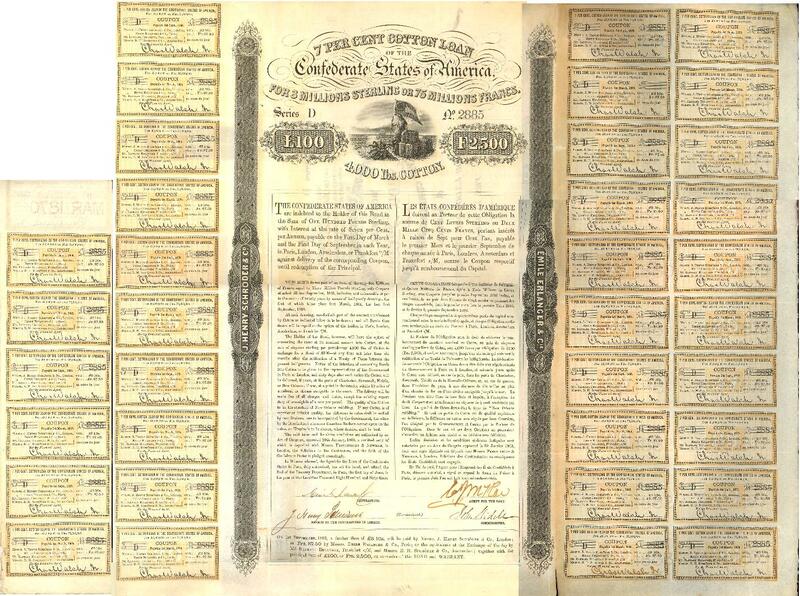 These certificates were issued in various denominations from $50 to $550,000. This CSA bond was issued in Richmond. It is Criswell number 123A and Ball number 166. The $100 bond serial number 13802 authorized by the Act of 20 February 1863 was issued on 2 March 1863. It was lithographed by Evans & Cogwill of Columbia SC. It was signed by C. A. Rose. Coupons are signed by ?? Jell....(?). It features Vice President Alexander H. Stephens. . A total of 28636 was issued. This CSA bond was issued in Richmond. It is Criswell number 124 and Ball number 192. The $500 bond serial number 21509 authorized by the Act of 20 Februuary 1863 was issued on 2 March 1863. It was lithographed by B. Duncan of Richmond Va. It was signed by Robert Tyler. It features C. G. Memminger. A total of 56417 was issued. This CSA bond was issued in Richmond. It is Criswell number 125 and Ball number 201. The $1000 bond serial number 2249 authorized by the Act of 20 Februuary 1863 was issued on 2 March 1863. It was lithographed by Evans & Cogwill, Columbia SC. It was signed by Robert Tyler. It features President Jefferson Davis and a view of Richmond from the west A total of 36550 was issued. This CSA bond was issued in Houston Texas. It is Criswell number 125v and Ball number 208. The $1000 bond serial number 43183 authorized by the Act of 20 Februuary 1863 was issued on 2 March 1863. It was lithographed by Evans & Cogwill of Columbia SC. It was signed by Robert Tyler and by Jammes Sorley. It features President Jefferson Davis and a view of Richmond from the west . A total of around 500 was issued. This CSA bond was issued in Richmond. It is Criswell number 120 and Ball number 212. The $100 bond serial number 12669 authorized by the Act of 20 Februuary 1863 was issued on 2 March 1863. It was lithographed by Archer & Daly, Richmond Va. It was signed by Robert Tyler. It features a Confederate officer on the Rappahannock River west of Fredericksburg A total of 31066 was issued. This CSA bond was issued in Richmond. It is Criswell number 121A and Ball number 220. The $500 bond serial number 3684 authorized by the Act of 20 Februuary 1863 was issued on 2 March 1863. It was lithographed by Archer & Daly of Richmond Va. It was signed by Robert Tyler. The coupons are signed by M. F. Cary. It features a soldier warming his hnds over a campfire. A total of 3800 was issued. This CSA bond was issued in Richmond. It is Criswell number 121 and Ball number 221. The $500 bond serial number 21956 authorized by the Act of 20 Februuary 1863 was issued on 2 March 1863. It was lithographed by Evans & Cogwill, Columbia SC. It was signed by Robert Tyler. It features a soldier warming his hnds over a campfire.A total of 26249 was issued. This CSA bond was issued in Richmond. It is Criswell number 122 and Ball number 241. The $1000 bond serial number 1941 authorized by the Act of 20 Februuary 1863 was issued on 2 March 1863. It was lithographed by Archer & Daly Richmond Va It was signed by C. A. Rose. It features Gen. Thomas J. "Stonewall" Jackson. .A total of 34891 was issued. This CSA bond was issued in Richmond. It is Criswell number 130AA and Ball number 266. The $1000 bond serial number 10424 authorized by the Act of 25 March 1863 was issued on 1 April 1863. It was lithographed by Geo Dunn & Co. Richmond Va It was signed by C. A. Rose. It features the Customs House. .A total of 6400 was issued. This CSA bond was issued in Richmond. It is Criswell number 138 and Ball number 280. The $1000 bond serial number 4863 authorized by the Act of 30 April 1863 was issued on 1 June 1863. It was lithographed by Evans & Cogswill Columbia SC. It was signed by Robert Tyler. It features James A. Seddon, Secxretary of War.. .A total of 8372 was issued. This CSA bond was issued in Richmond. It is Criswell number 142 and Ball number 296. The $100 bond serial number 1941 authorized by the Act of 17 Februuary 1864 was issued on 1 March 1864. It was lithographed by Evans & Cogswell Richmond Va It was signed by C. A. Rose. The coupons were signed by Robert Tyler. It features the Great Seal of the Confederate States of America.. A total of 6200 was issued. This CSA bond was issued in Richmond. It is Criswell number 143B and Ball number 312. The $500 bond serial number 1206 authorized by the Act of 17 Februuary 1864 was issued on 1 March 1864. It was lithographed by Evans & Cogswell Richmond Va It was signed by E. Apperson. The coupons were signed by Robert Tyler. It features the Great Seal of the Confederate States of America.. A total of 5200 was issued. This CSA bond was issued in Richmond. It is Criswell number 144B and Ball number 325. The $1000 bond serial number 5302 authorized by the Act of 17 Februuary 1864 was issued on 1 March 1864. It was lithographed by Evans & Cogswell Richmond Va It was signed by E. Apperson. The coupons were signed by Robert Tyler. It features the Great Seal of the Confederate States of America. .A total of 10700 was issued. This is a photo of the complete bond that measures 17" cy 27'. This CSA call certificate was issued in Richmond and was redeemable i n Columbia SoCa. It is Criswell number 162E and Ball number 348. The $5000 certificate serial number 787 authorized by the Act of 17 Februuary 1864 was issued on 2 September 1864. It was letterpressed by Ritchie & Dunnavant Richmond Va It was signed by C . A.. Rose..A total of 1627 was issued. It is punch cancelled. This CSA Non Taxable Certificate was issued in Richmond. It is Criswell number 152 and Ball number 364. The $500 certificate serial number 17430 authorized by the Act of 17 Februuary 1864 was dated 9 March 1865. It was letterpressed by Ritchie & Dunnavant Richmond Va It was signed by E. A. Apperson. It was to payable in Mobile, Ala. A total of around 20000 was issued. A series of Cotton Bonds were issued in Europe authorized by an Act of Congress dated 29 January 1863. They were printed by an unknown European printer but probably British in that every band has British tax stamp. The bonds have an ornate border and a vignette of Liberty leaning on cotton bales and holding a CSA flag with a ship sailing off in the distance. One of the key events which made blockade running a viable business in the latter half of the war was the Erlanger Loan (or "Cotton Loan"), an issue of bonds made by Emile Erlanger and Company of Paris. 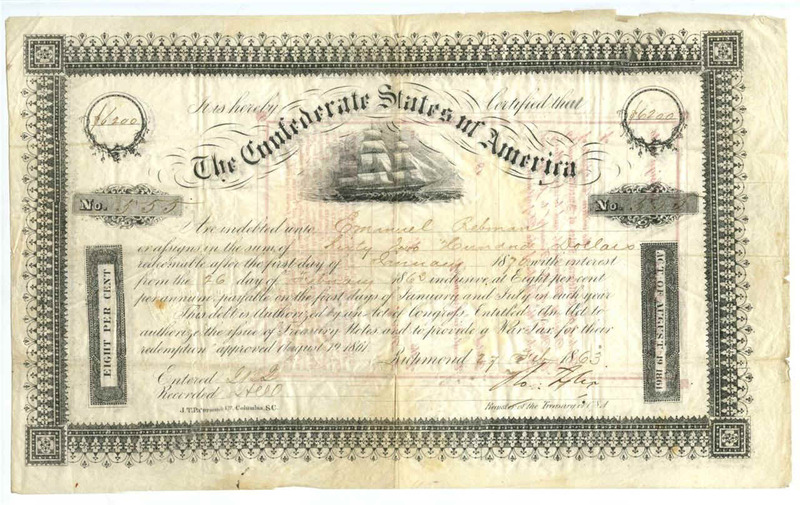 Because Confederate currency was worthless in Europe, Erlanger cotton bonds became the de facto currency used by the South when purchasing ships, supplies and other war materiel abroad. This bond is the .£100/FF2500 which was exchangeable for 4000 lbs. of cotton. This bond is signed by Emil Erlanger,Paris loan banker; J. Henry Schroeder (Schroeder, Wagg), London bankers; Colin J. McRae, CSA European agent; and John Slidell, Confederate Commissioner to Paris. Slidell was one of the two CSA Commissioners to Europe that were kidnapped by the USA from a British ship RMS Trent that sailed from La Habana Cuba while in transit to Europe. The USA was forced to release them when Britain protested this illegal act and threatened war. Most of the State governments in the CSA issued bonds mainly for defense of their territories from Northern forces. Presented here are examples from most of these States. The State of Alabama issued a series of these bonds called Stock Certificates. This one is the $500 bond issued on 1 March 1861 withy the serial number 49. It is signed by the Governor, A. B. Moore and the Comptrolle4r W. J. Greene. Coupons were also signed by W. J. Greene. It features the State Seal of Alabama. It is Criswell number 51A. This a State of Arkansas bearer $5 War Bond issued in Little Rock July 26, 1861 payable to T. C. Flournoy or bearer. It is serial number 2381. It was printed by J. D. Butler, Print. Lit. Rock. It is signed by O. Barham, Treasurer, and co-signed by W. R. Miller, Auditor. Barham also signed the coupons. It is Crisell number 61J. This $500 bond was issued under authority of the State of Georgia General Assembly Act of 11 December 1861. It was issued on 1 February 1863 and was signed by Governor Joseph E. Brown and Secretary iof State N. C. Barnett. It features the State Seal at the center flanked by vignettes of a dock scene at left and a battle scene at right. It is Criswell number 61B. This three year bond was issued by the State of Louisiana on 1 March 1862 under the authority of an Act approved January 23, 1862. It is signed by Governor Tho. O. Moore, Auditor H. Peralya, Secretary of State P. Hardy, and Treasurer B. L. Defrese (?). It has serial number 609. It is Criswell number 62A. This $100 Missouri Defence Bond requisition was issued for defense of the State by the Missouri State Guard. It was never actually issued though it has been well circulated. The bond pictures President Jefferson Davis with Ceres left, the State Bear Shield right.. This issue exists only as remainders as the Confederate sympathizing state government was not able to enter it into circulation before having to flee into exile at Marshall, Texas. This State of North Carolina $1000 bond was issued on 1 March 1862. It is serial number 2504 and is signed by Governor Henry T. Clark and Public Treasurer D. N. Courts. Coupons are signed by W. H. Dodd. IOt was printed by J. T. Patterson & Co., Augusta, Ga & Columbia S.C. It features a vihgnette of Commerce flankede by Cupids and a ship at the bottom. It is Criswell number 62I. This State of South Carolina $100 bond was issued on 1 January 1861 in Charleston. It was printed by Evans & Cogswill of Charleston. It feature a vigmnette of a Palmetto Tree with articles of Commerce and Agriculture. Thids bond was issued just after Secession and before formation of the CSA in February hat year. It is serial number 2519 and was signed by Treasurer W. J. Laval and Comptroller T. J. Pickens. It is Criswell number 60A. This State of Tennessee bond was issued on 1 April 1862 in Memphis under authority of an Act March 18, 1862 relating to a War Tax. It is serial number 943 and was signed by Governor Isham G. Harris and Secretary of State J. F. R. Ray. Coupons are signed by J. T. Dunlap. It was printed by Saunders, Clark & Norton, print. 15 Madison street, Memphis. It has a redemption date on 1 April 1867. This is Criswell number 62B.